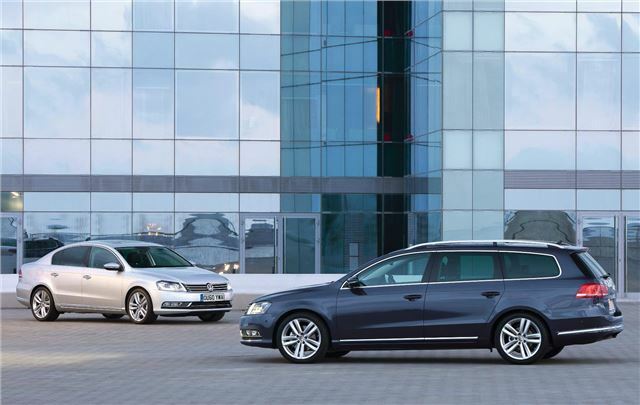 Volkswagen has announced prices for the seventh generation Passat, which goes on sale in January 2011. It will start from £18,470 on the road for the saloon and £19,745 for the estate. Unveiled at the Paris Motor Show last month, the new Passat has a more sophisticated look from the outside with clean lines while at the front there is the now familiar Volkswagen family grille and headlights, first seen on the Volkswagen Golf. It's not strictly new, more a thoroughly reworked version of the outgoing Passat, so every body panel apart from the roof is new. It is marginally longer than the car it replaces, but similar in width and height. The headlights include distinctive LED running lights while at the rear the tail lights have subtle chrome highlights that extend down the side of the car. The upmarket look continues inside with new seats that are available with heating and cooling along with a massage function. There's a revised dashboard with new dials, trim finishes and an analogue clock along with chrome inserts and the option of ambience lighting similar to that found in the Phaeton. The centre console has also been redesigned with revisions to the minor controls as well as new door trims. Every diesel engine is now badged as a BlueMotion Technology product and is equipped with battery regeneration and Stop/Start systems as standard. The result is that the entry-level 1.6-litre TDI 105 PS is capable of exceeding the economy of the outgoing BlueMotion model with a combined economy of 65.7 mpg and CO2 emissions of 114 g/km. In turn, the new BlueMotion model, due to go on sale in early 2011, will return 68.8 mpg and emit 109 g/km of CO2. Upgraded common rail diesel engines and gearboxes also feature, with a six-speed manual gearbox being fitted to the 1.6-litre TDI 105 PS engine for the first time. Three trim levels will be available: S, SE and Sport. Additional equipment added to the new Passat over the outgoing model includes an iPod interface and leather multifunction steering wheel for the S model. The SE trim level gains an eight-speaker digital radio, Bluetooth connectivity and the new driver fatigue detection system; while at the top of the range the new Sport model gains RNS 315 touchscreen satellite navigation. All Passats will be fitted with six airbags, ABS (anti-lock braking system), ESP (Electronic Stabilisation Programme) and WOKS (whiplash-optimised head restraints) as standard. In addition, the new Passat promises to be the quietest and most refined iteration yet. Thicker glass is fitted to the side windows while the windscreen features a thin plastic film sandwiched between two layers of the glass to help reduce noise transmission. The front bulkhead incorporates increased sound deadening which, combined with the latest generation of common rail diesel and TSI petrol engines, aims to cut the engine noise entering the interior of the new Passat.